Saturday, August 8, 2009. It was a wet and miserable day. 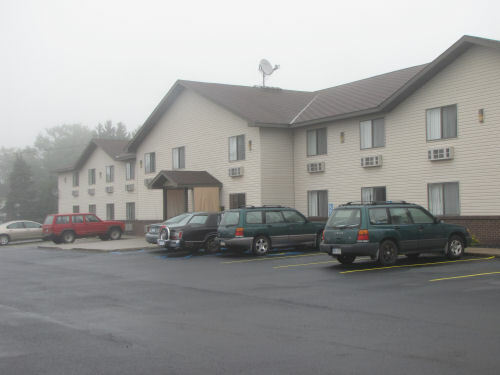 We were not at all sorry to spend it lounging around a motel room. I don't have specific memories of what we did, but we are really good at playing our favorite word game Quiddler, reading aloud, and finding somewhere to have a good dinner. It was Marie's birthday, so I'm sure I teased her a fair amount about being old. We drove around town a bit that afternoon and spotted the car for the next day's hike. It was a seriously non-activity day. 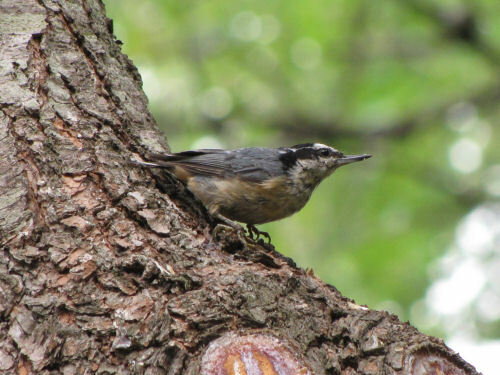 Caught a wet nuthatch looking for dinner. 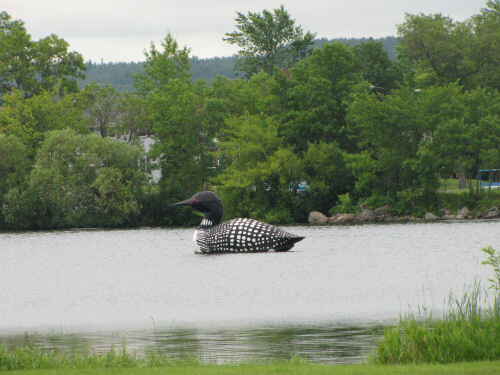 The funniest thing was the large inflatable loon that floats around the small lake. Want to get a better idea of its size? Hilarious. But, we do only get one day off. Tomorrow we'll be back on the trail. In local news: the great blue herons have returned. I saw one flying over this morning on the way to the river. I used to know where their rookery was, but they abandoned that one and I don't know where it is now. They are right on time, usually showing up in February or March. I dried clothes outside for the second time this month. That is certainly a February record. Actually, even the one time was a record. 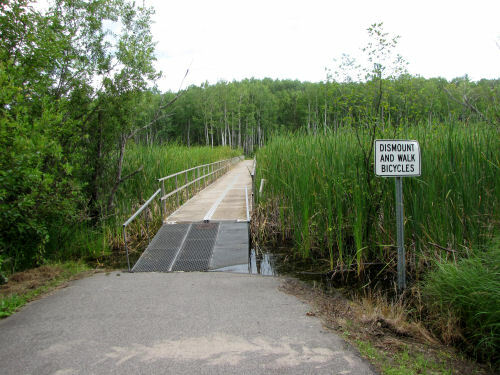 We continued north on the paved Mesabi Trail. Iron mining still defines the area. Towns are proud of their heritage. Both of these displays were in Kewatin. 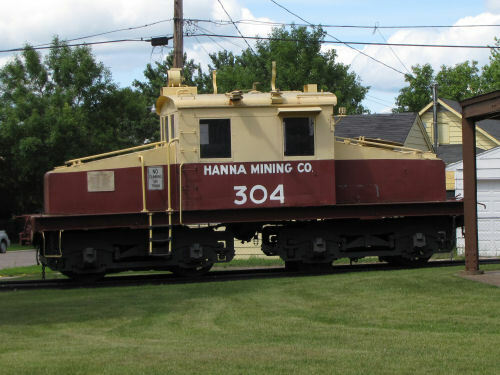 This tough little engine is an electric 60-ton steeple cab, designed especially to pull cars from the depths of the mines. Here are two of the small cars historically used inside the mines. As we continued north, we got a glimpse of what modern mining looks like. 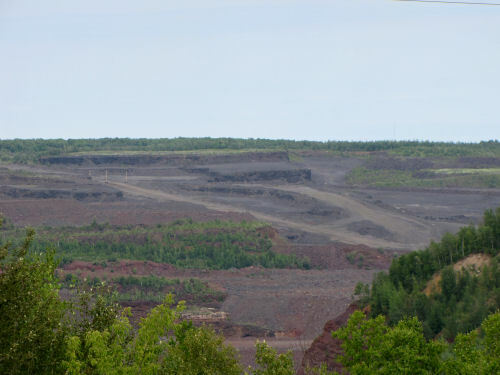 This is the largest open-pit iron mine in the world, the Hull-Rust Mahoning Mine. It's 3.5 miles by 1.5 miles, and is 535 feet deep. Say what you will... raw materials for the things we insist on consuming have to come from somewhere. 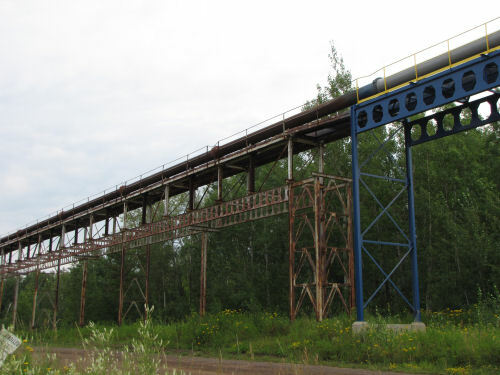 The ore is carried through pipes above ground (perhaps with an internal auger) to locations where it can be collected for transport. We enjoy these cultural aspects of the trail as well as the natural ones. However, the next event of the afternoon was not as much fun. I'd planned long days anyway, just to finish all these paved/road miles. But we hit a real unexpected snag. There was no information posted about how long the detour was (my maps seemed to indicate it had to be at least two extra miles). There was no information as to whether hikers could get through with care, just not bicycles. There was no clue as to how far ahead it was. Should we continue and see if the way was passable, with the possibility we might have to backtrack to this point? 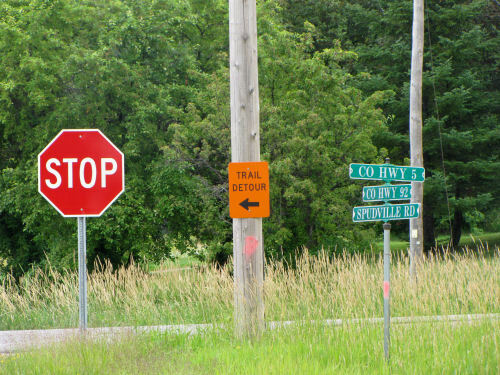 We chose to follow the detour signs. 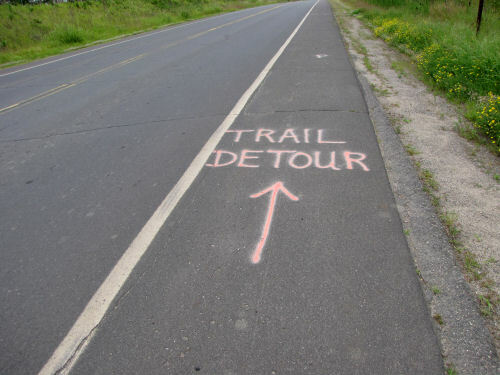 And follow the detour signs. A planned 16 mile day turned into nearly 20 miles. Marie says it's the longest day she's walked. This sign was not us. We limped into Chisholm. Pavement walking is hard. Literally. Our planned day off was theoretically a day away. But rain was predicted. We know how to flex. 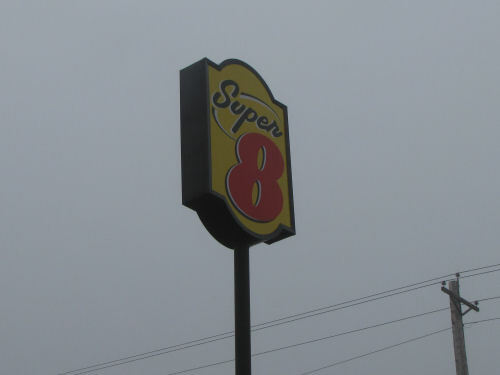 We drove back to Grand Rapids, broke camp and had a Super 8 night. We found out later the trail was completely passable. Repairs had been completed, but the signs had not been removed. Sigh. And the long day probably contributed to problems that began to develop. Hiking day 5, 19.5 miles for a total so far this trip of 83.1 miles. 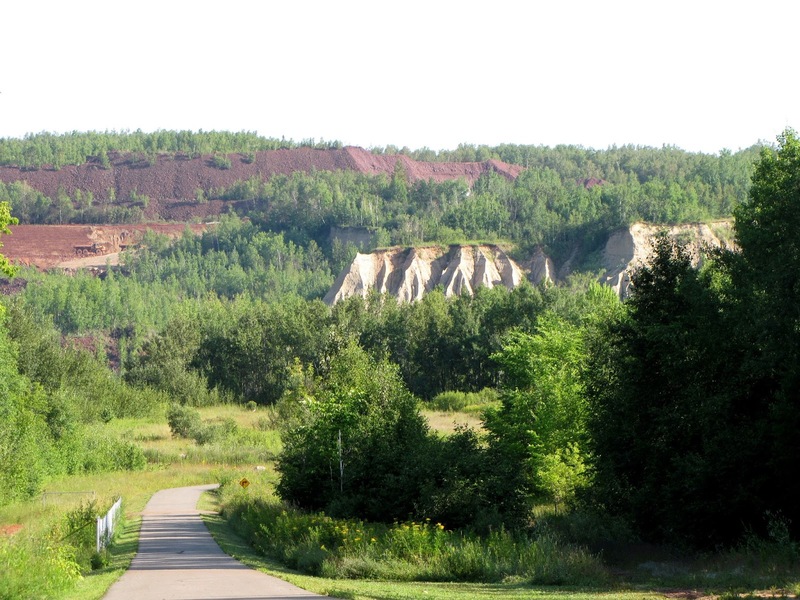 Thursday, August 6, 2009, Marie and I continued north on the paved Mesabi Trail through former iron mining lands. 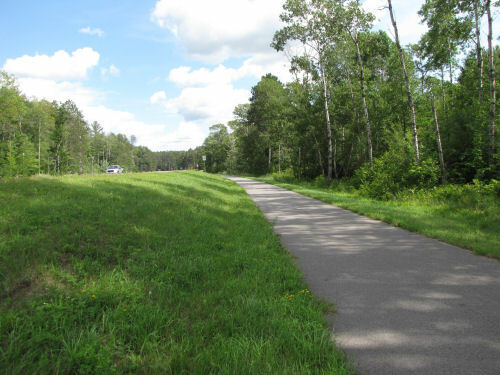 This view shows how the trail has more interest and topography than a simple rail-trail. You can also see the greenery beginning to cover the raw landscape. Two of our most interesting wildlife sightings happened this day. 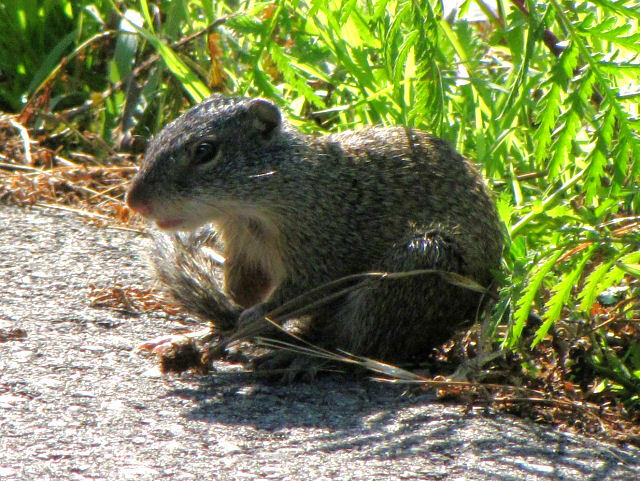 First we saw a mammal completely new to me at that time, Richardson's Groundsquirrel. It's more commonly called a Flickertail because of it's nervous habit of twitching that tail. 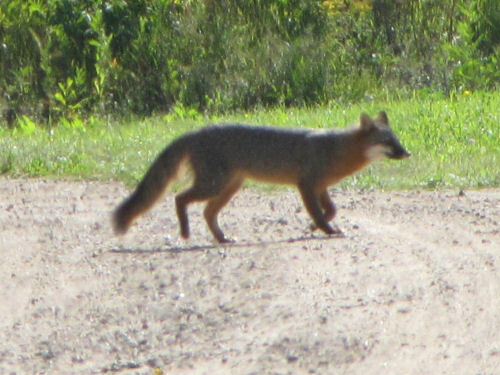 Not long after that, a gray fox calmly trotted across the trail ahead of us. Unfortunately, the picture isn't focused well. But I was amazed at how unconcerned the animal was with our presence. I think Marie loves the turtles best of all. This is a common Midwestern Painted Turtle, but it's not covered with pond muck or duckweed, so it was looking nice. 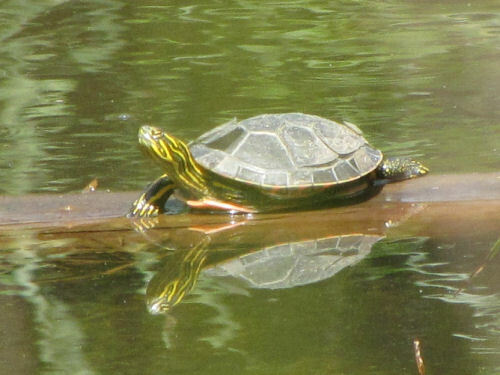 I've recently learned that this sub-species differs from the Eastern Painted Turtle in a couple of ways. Easy field mark is that the scutes (plates) of the shell are alternated across it's back. And, I found another new flower. The blue one. It's Creeping Bellflower, Campanula rapunculoides, and the yellow is Common Tansy, Tanacetum vulgare. 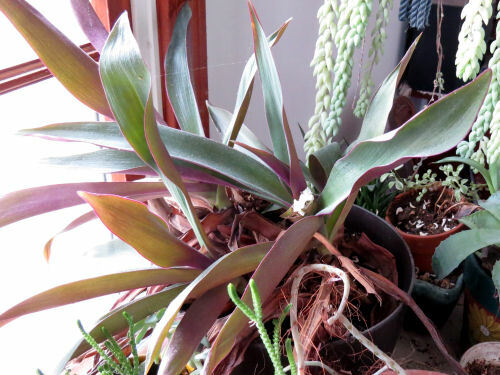 Although the blue and yellow are so pretty, both plants are alien. 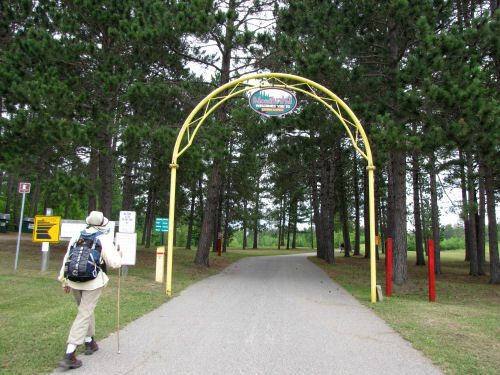 For the days we followed the Mesabi Trail we loved marking our progress with the gateways to each town. Marble to Kewatin, Minnesota. 15.8 miles, 63.6 to date for that trip. Since I managed yesterday to stumble into pictures of a hike I never blogged about, I've decided to take us all back to this trip in 2009 for the next few days. I even accidentally hit the first day of that hike. There could be interruptions if something exciting happens. Or not. Anyway, this was the longest continuous time that Marie and I ever were out. I had an obsession with completing the Minnesota miles of the North Country Trail that summer. 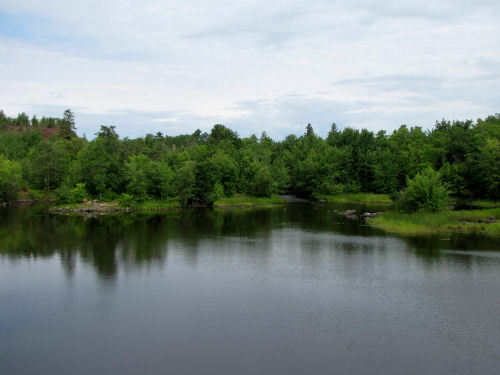 We began by connecting the Chippewa National Forest with the Kekakabic Trail, a distance of 180 miles. Yesterday, I showed you the road miles that took us from the Chippewa into Grand Rapids (two days). 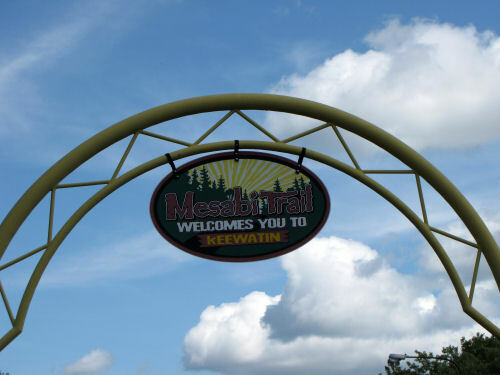 There we picked up the paved Mesabi Trail. The trail is not a true rail-trail, as many portions are not old rail bed. However, a lot of it follows the former Duluth, Missabe and Northern rail grade. 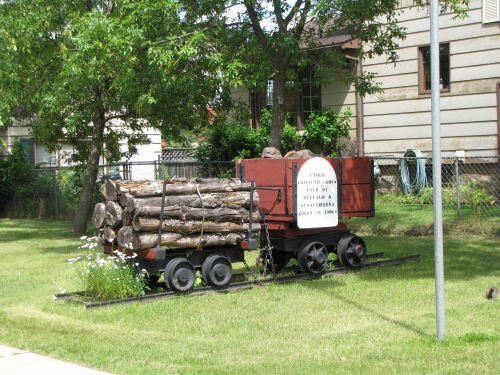 This line opened northern Minnesota for iron mining. 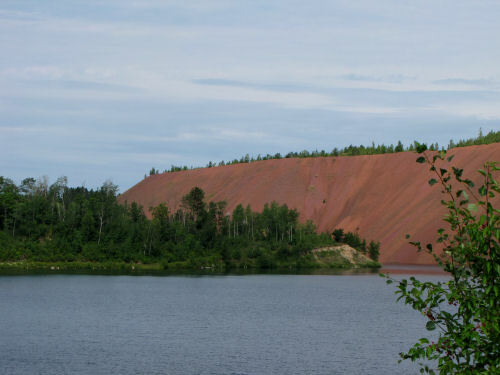 A lot of the landscape we saw was great hills of red ore tailings surrounded by lakes formed in the open pits. It had a certain beauty of its own. Very little active mining remains. the companies are working very hard to reclaim the land, undo the ecological damage, and make the area attractive for recreation. Aspen trees are covering the tailing hills. Nature does heal itself, although sometimes it needs some help. Along the way, we saw continuous reminders of the former industry, such as this nifty Diamond Reo truck. 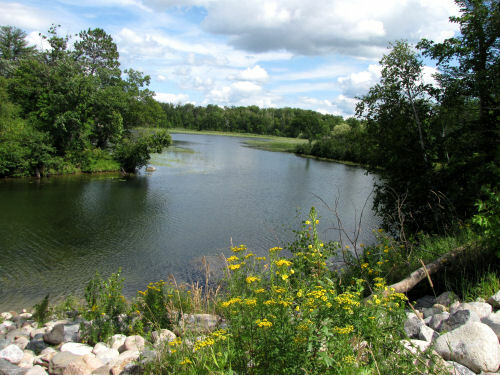 The primary waterway we now followed was the Prairie River, which flows into the Mississippi in Grand Rapids. Since that time, we have encountered a much longer floating bridge in Ohio, but in 2009, this was the first one we had ever crossed. You know me... I was greatly interested in the wildflowers. 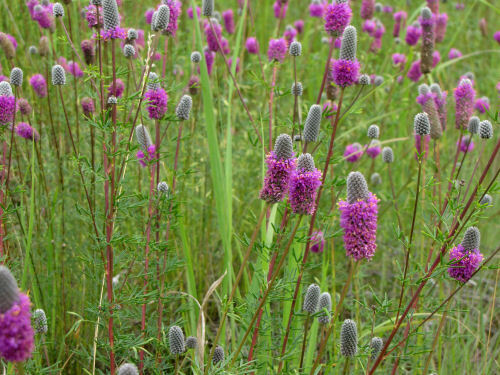 Prairie clover, Petalostemum villosum, was one we had learned in North Dakota, but it always brings oohs and aahs when in bloom. 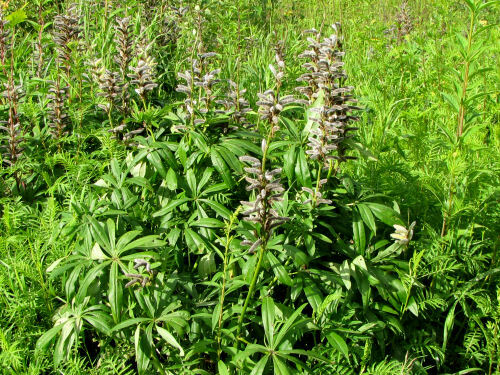 Culver's Root, Veronicastrum virginicum, can be seen throughout the northeast. It's not just a prairie plant. This one had me stumped for a while. 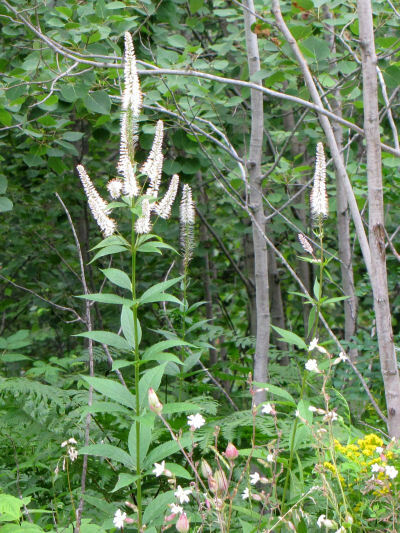 Sadly, that's because it's native to the western US, but is considered invasive in Minnesota. It's bigleaf lupine, Lupinus polyphyllus. Yup, pretty much like the common one, only much bigger and much easier to grow. "So who cares which one grows?" you ask. The endangered Karner Blue Butterfly needs the common one for its life cycle. Here, it's gone to seed, busy pushing the native one out of it's natural range. This was August 5, 2009. Day three of the hike, 16 miles, total 47.8. The actual day was dreary, beginning with thundersnow and ice which changed to rain. I worked all day and am soon headed back for the Friday night routine. But I'm reading a book about conquering fear and hiking. The author mentioned a study where hospital patients healed faster when they could view nature scenes through their windows. Even seeing pictures of natural settings promoted healing! So, I'm playing that game where you take some numbers and look in your computer files for pictures. The date is 2-24. So I looked on my second SD card after I started taking digital pictures that were stored on them. Here is the 24th picture. I took a chance that it would be something outdoors, and I win that lotto. 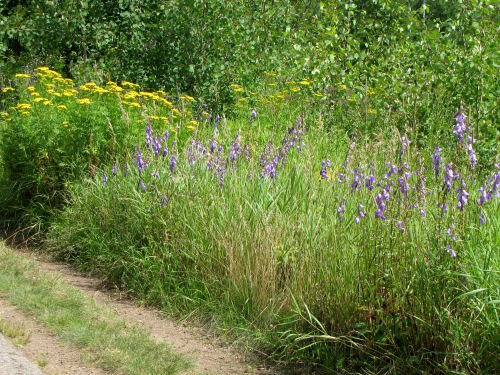 This is a multi-use trail in Grand Rapids, Minnesota. 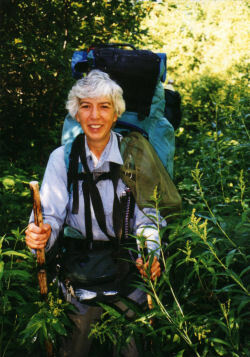 Marie and I hiked it in August of 2009. It's part of the North Country Trail connections. 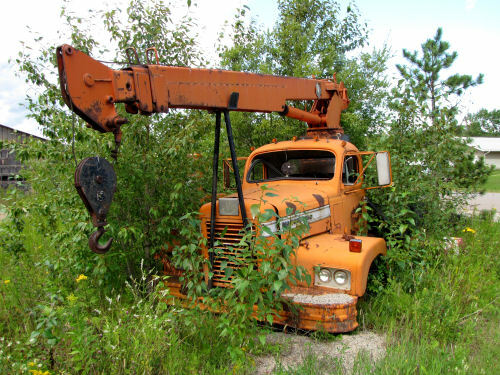 When I first saw this picture I assumed it was part of the Mesabi Trail, which goes north from Grand Rapids. 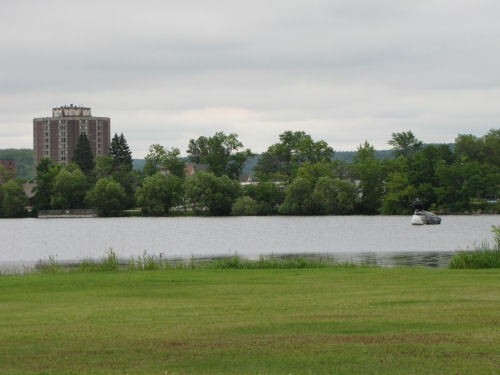 However, this was the day we hiked into town from the Chippewa National Forest. That was mostly road, but there must have been some small piece of paved urban trail. Since I never really blogged about any of this (very hard to get internet connections on the road then), I'll put the picture in some context. As we connected from the Chip to Grand Rapids, we generally followed the route of the Mississippi River. 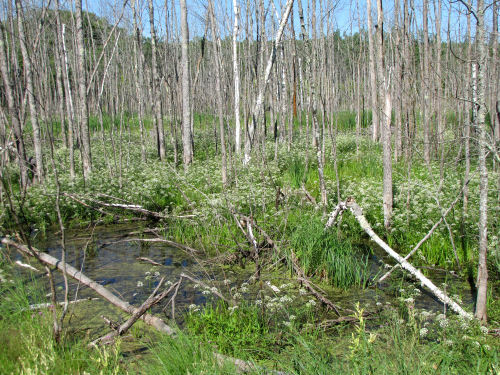 That same day we also walked past some lovely wetlands filled with water parsnip (Sium suave). 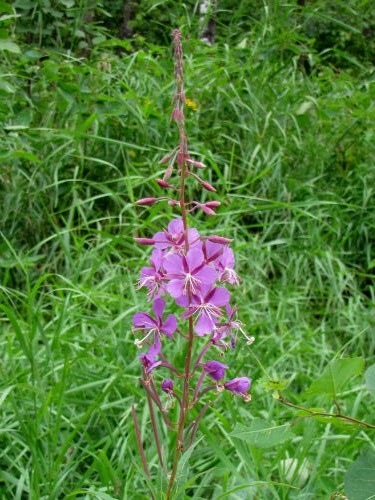 If there is any one flower that says northern Minnesota in late summer it's fireweed, Epilobium angustifolium. 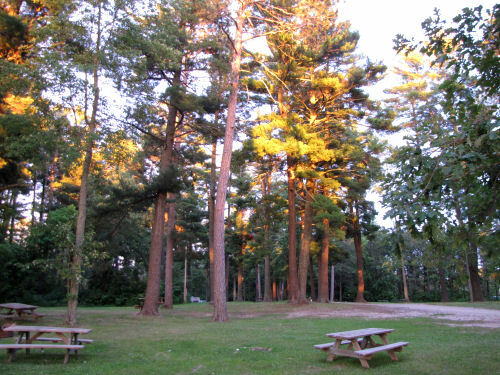 We camped for several nights at the City Park where the sites were very reasonably priced. The alpenglow on the trees that evening was gorgeous. The joke was on us a couple of nights later. We found out the park was right next to the speedway race track. On Saturday night we literally could not even stand being in the tent, so we took our book and drove to a different park many blocks away where we read and then talked till long after dark and it was "safe" to return to our tent. Here's hoping this little nature moment from a few years back made you smile. 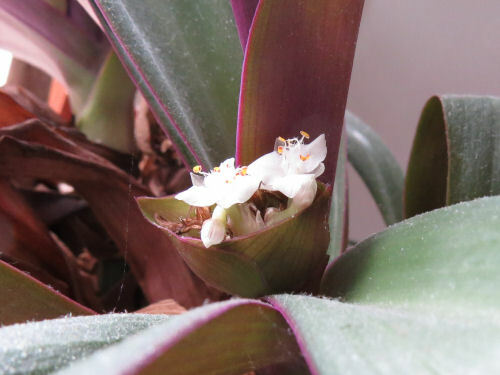 My houseplants are pretty much abused, but this one has agreed to bloom again. Just ignore the dust and spider webs. 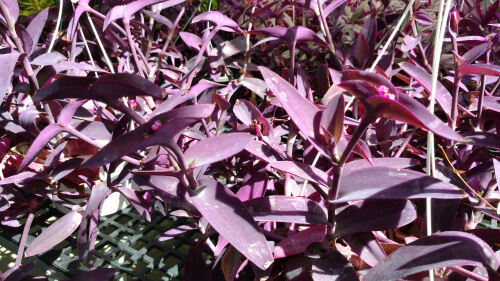 It's the one called Moses-in-the-Boat, Tradescantia discolor. 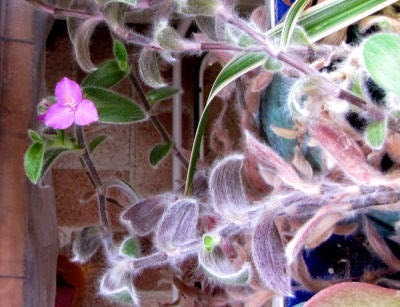 When it bloomed before I gave a lot of explanation, so I won't repeat that. 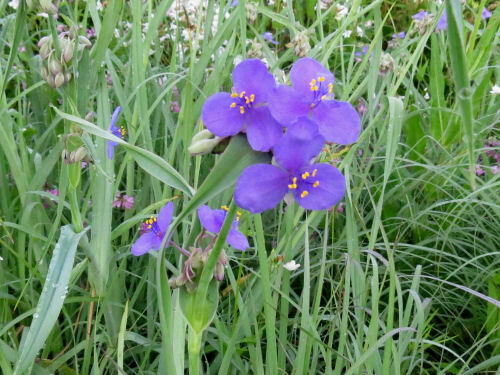 Instead, I'll show you some previously featured relatives, other Tradescantia. Unknown, but in the same family. My friend Irene has also been dogless for quite a while now. I shared when Pearl passed on in 2013. Then in 2015, Sandy Fe, the older of the two dogs died quietly. Pearl loved everyone. Sandy was more selective, but I was on her good list. Dogs mostly just like me. Anyway. Irene is more than ready to welcome another canine into her life. 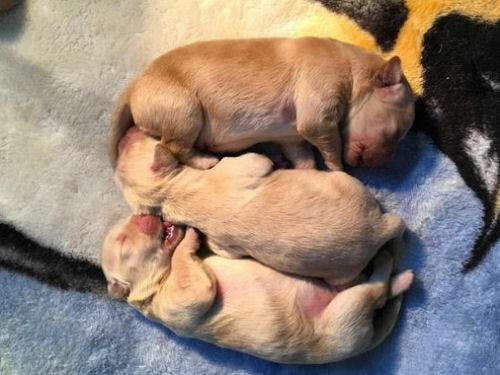 One of these cuties is going to be hers in a few weeks. Here they are at four days old. 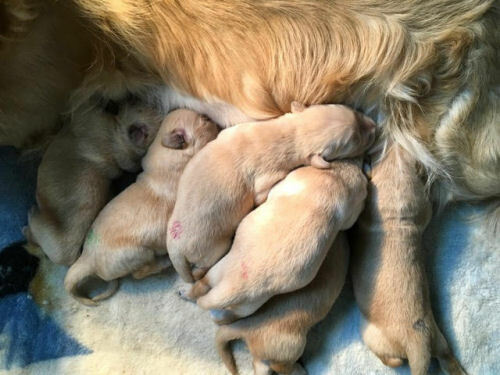 Yup, another golden retriever. I'll get to meet whichever one it is this summer at the wiggly age of about 6 months.